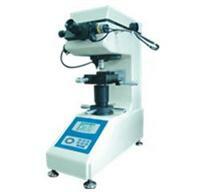 THV-1 Micro Vickers Hardness Tester adopts LCD screen to display. By mean of control keys, HV or HK hardness scales, testing force and duration time can be selected and brightness of light source can be adjusted without steps. With measuring microscope, it may test out the length values of diagonals D1 and D2, then press the keys to input the length values, and the hardness values will be displayed on the LCD screen. Operation is easy.